Outside of Florence stood a Carthusian charterhouse on the crest of a forlorn hill, where a century ago I had hidden a hunted man and a stolen book. Now, I had need of both. Philip the Second of Spain continued to plot against our beloved majesty, Queen Elizabeth, and to cloak his schemes his assassins had crippled my web of spies abroad, murdering many by poison or the blade. To protect England, I needed reports from other sources and thus had promised the spymaster of Venice, who called himself Antlion, that I would return his Proteus Codex to him in exchange for information. And so I had ridden south with my apprentice Luca to the Certoza del Galluzzo, arriving at dusk. A lay brother muttered prayers to himself as he swept the front entrance. Ten years had passed since I last had seen him: Brother Giotto, my friend D’Afide’s kitchen assistant. Brother Giotto regarded us suspiciously as we dismounted, fear and worry clouding his face. I didn’t blame him; he wouldn’t recognize me in my current guise. Last visit I had taken the shape of a swarthy, stolid farmer, but now I appeared before him as a paler, younger man with an acrobat’s frame. “Brother Giotto, I’m Filippo, and this is Luca. We’ve come to see the charterhouse cook Davide, also called the basil thief.” I produced an amber with a fly trapped in its center: the price for seeing D’Afide, as we had decided long ago. “Your friend’s become half-man, half-wolf!” Giotto crossed himself. “If he weren’t the kind and forthright man I know him to be, I’d have fled and left him to starve. I had stolen the Proteus Codex from Antlion when he was living in Florence as Leonardo da Vinci, painting the Mona Lisa and completing the Codex, his great book on shapeshifting. It was a dangerous volume full of forbidden transformations and traps; I had learned what I dared from it. The Codex taught me the variations of the living body, tricks that could save my life. For example, by growing my heart in a different place than where an assassin might drive his blade, I might survive such a blow and live another day. Such unusual skills had served me well whilst I carried out missions as Queen Elizabeth’s shapeshifting spy. I had always intended to trade the Codex back to Antlion for a favor, and with a war against Spain looming, it seemed wise to repair my diplomatic relationship with him promptly. Admiral Álvaro de Bazán had passed away in Lisbon days ago, and the Seventh Duke of Medina Sidonia had been newly appointed to the command of the Spanish fleet. I would need the intelligence gathered by Antlion’s many spies on the Duke and the Spanish court to better advise Elizabeth. I had told D’Afide not to pry inside the Proteus Codex. Why had he, after all these years? It had taken me months to decipher half its secrets. Within the book were diagrams, secret codes that described stages of transformations and successively deeper and darker metamorphoses that went beyond the limits of what it meant to be human. But if you didn’t know which was a dangerous page and which wasn’t, you could easily misstep with the transformations and make a change to your own anatomy that could kill you. I had first met D’Afide, then a rotund lad, in France in 1388 during my travels across Europe, when he was apprenticing under the cook to the court, Taillevent. I discovered his potential for shapeshifting and tutored him in the art, even as he mastered his skills as a chef. He took the name D’Afide—which meant Aphid—when he joined the Elect but made the mistake of shaming Niccolò Machiavelli, who in revenge framed D’Afide for poisoning Antlion’s favorite apprentice. Given that Antlion never forgave lightly, D’Afide had turned to me for protection. I found him a safe haven in this charterhouse as a lay brother but in return had tasked him to keep the Proteus Codex safe. D’Afide had had to temper his love of good food in his new role as the cook for the monks. He had always been the gourmand, the snobbish chef, cook to emperors and kings, but it was basic fare at best at the monastery, and he had to stoop to cook for those who had no use for high cuisine. In the years that D’Afide had hidden here, however, he seemed more humble, saying that he now recognized taste in its most virtuous form. To hide his immortality he had let himself go fat before shedding his identity and taking a new one, faking the death of the old chef even as he crafted the guise of the new. He had taken the name Davide for this latest incarnation. Luca played with the ‘turn’, the little food alcove that spun on an axis behind a tiny hatch. I put a piece of amber into the opening and turned it. We Elect could permanently change our shapes but only if we could tap into the Lightning trapped inside amber. The jewel would let D’Afide know that it was me, and perhaps he would let me in. “Could it be that he’s become a wolf already?” Luca said. Were we too late, and a hungry wolf waited inside that cloister to gorge on human flesh? Luca gave me a boost onto the arcade roof, then I helped him up. His feet had just cleared the archway when another lay brother entered the courtyard. Had he seen us? No time to worry. Luca and I dashed across the rooftop and onto the other side. Together we dropped down into the garden, carefully approached the doorway, and entered. The room stank from excrement, sweat, and whatever else. And there, in the dim light we saw D’Afide—or rather, what he had become. Half-bear? Half-wolf? He had grown hairier than anyone I had ever seen, and his frock was torn from his great size. But he didn’t seem to see me; rather, he sniffed the air and turned towards us, but backed away like an animal sensing danger. My friend was losing his humanity before my very eyes. And there, on the table further in, was the Proteus Codex. I prayed that it was intact, or else I would lose my chance to placate Antlion and buy the intelligence I needed on the Spanish plot. He either didn’t hear me or was ignoring me. I raised my voice and said his name again. He bared his teeth, his canines longer and sharper than I’d ever seen in a human being. “I think he’s deaf and blind,” Luca said. The wolf-man growled and advanced on us. I pushed Luca behind me and reached into my pocket for a silk handkerchief. Like amber, silk contained Lightning as well, but its power was more ephemeral, and its shapes held quite frailly and could be unraveled. Though D’Afide had never been a fighter and his crippled senses made it hard for him to see me clearly, his transformation had given him great feral instincts. I barely dodged his claws. I swept my leg under him and tripped him, then clasped his hand with the kerchief silk between our palms. “Read me, D’Afide!” I was counting on him to feel me. The shapes of those who had touched the silk last became entangled therein. With both of us touching the silk, I wanted him to sense who I was, just as I could feel his inhuman shape. D’Afide bit at me but I managed to hold him back. Luca drew a stiletto from his boot. D’Afide stopped fighting me, perhaps sensing my intent through the silk. Cautiously, I led him to the table where the Codex was. Fragments of a crushed piece of amber lay on the table. Luca lit a candle so that we could better see the book. There was a test at the handle of the locked door, then knocking. That lay brother must have seen us earlier and was checking on us. “Don’t answer that,” I said to Luca. “How will this work, Master Flea?” he asked. Now that I had a better look at him, D’Afide seemed more human than I first thought. It was the coarse brown hair growing everywhere on his body, even his eyelids, that gave him the semblance of a beast. I moved the Proteus Codex into the light. It had a hidebound cover made from sealskin, protecting over a hundred pages within. Proteus of legend had been a herdsman among the sea-beasts, dwelling with a colony of seals. Burned into the cover were images of beasts and insects: pig, wolf, bear; seal, lion, leopard; antlion, cicada, bee. I flipped it open to a random page and saw the mirror-image cursive handwriting that was unmistakably Leonardo da Vinci’s, interspersed with anatomical sketches, formulae, and the Three Hares symbol on every page. “A lot of what I learned from the book comes from understanding the diagrams and his mirror-writing notes.” I showed Luca some of the anatomical drawings throughout the text. I flipped to the first page and showed him the largest of the Three Hares diagrams. “But it gives the illusion that each rabbit has two ears,” Luca noted. “What of the words in the spaces between the rabbits?” Luca was referring to four words in the diagram: one in the center between all of the ears, and the other three seemed like dust before the gaze of each hare. “Then I could lose you to the same danger,” Luca said. “Clear.” But I knew Luca would hesitate to kill me. A noble sentiment but likely fatal if he did; a monstrous change, especially that one that made me lose control, might make me snap his neck in a berserk rage. I put a piece of amber in my fist and another on the table. I would need the power of the first to change my shape, and once I was ready to bring D’Afide back I’d have him tap the power of the spare. I had hoped D’Afide could guide me through the path of shapes himself, but it looked like I’d have to guess how he navigated them. I concentrated on the first protean seal. Looking at the Three Hares, I let my mind drift, opening to its weaves and whirls. I didn’t change perceptibly, but something inside me did shift, giving me the uncanny sight that rendered written words in color. The four words took on new hues. The shade of unripened green grape for the Italian word for sea, in the middle of the seal. Then, the three others in the second circle—heart was slate gray, music was the color of the harvest moon, and snake was the hue of blood from a fresh cut. One had to be very careful in judging the exact shade of the words. Close enough was not enough. The first time I had tried the seals, it had been the path of the word heart that I followed and found to be safe, as far as I was willing to go. Snake had been the false start, the dreaded breathing problem that I had discovered and undone before it became deadly. Surely D’Afide had not followed snake. But had he followed the same transformations as I had down the pathway of heart, or had he taken the path of music? That had been the reason I hadn’t pushed my exploration of the protean seals. Without a key that guaranteed a safe passage into the deepest mysteries of transformation known to our kind, there was only so much that I dared explore. Four-deep had been my limit, but I feared that D’Afide strayed further than that, possibly in a direction that I hadn’t tried. 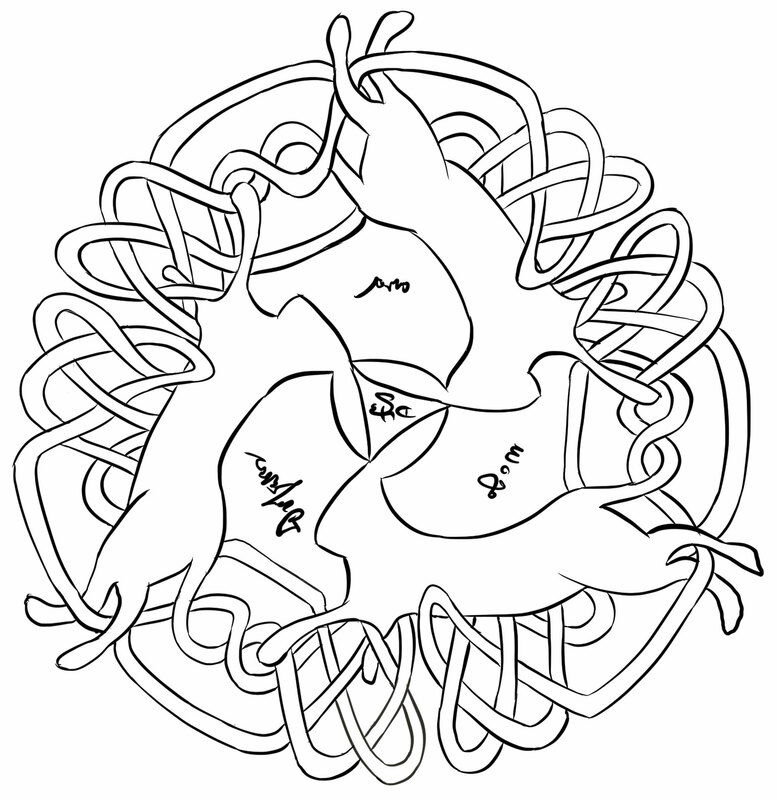 Following the path of heart, as I remembered, led me to a page where the word at the center of the Three Hares was fear, shining the same color as the word heart. Without the word-color vision, it would have been impossible to find the next safe transformation. As I recalled, the change was one that allowed a shapeshifter to completely reverse the placement of his internal organs, as in a mirror. One could achieve the same effect by slowly changing the position of each organ, but what the protean seal allowed was a simultaneous, almost instantaneous change. But had D’Afide followed that path? Possibly. I had to deduce which shape he had taken based on the changes I knew he had implemented. But could I confirm whether his organs had been reversed? The heart was normally located more towards the left side of a person’s body, though there was variation among people. I pressed my ear to his chest and listened first on the left, then the right. His heartbeat seemed stronger on the right. I would have to trust my intuition that he had taken the same step as I had, in this regard. But to be sure, I examined the wolf-man imprint he had left in the silk that we both still held and explored the pattern of his organs. Indeed, he was mirror-reversed on the inside. “He followed the word heart to the second seal fear,” I said to Luca. Luca turned the pages for me, until he found the word fear in the middle of another Three Hares seal. I began change number two, drawing more Lightning from the amber, and the protean seal forced my organs into their reversed configuration in a flash of pain as of a terrible fall from a height. “The risks are still very real.” I examined the three other words of this new seal. Intention was the shade of an eggplant’s skin; invention was the blue of the midday Mediterranean sea; and lastly, revolution was the red of a dying ember. Intention had been my choice, so long ago when I experimented with the Codex. It was a change I was familiar with, where my skin became so finely attuned to touch that I could discern subtle textures and changes with my sensitive fingertips. I had explored the other two paths and had the fortune to reverse the transformations before I could slide into further trouble. Invention had given me extra fingers, while revolution led to total insensitivity to any kind of pain. One might believe it was a fortunate transformation rather than one that was harmful, but such a condition could make you not notice a bruise, wound, or burn. Not being able to react to pain meant that you might ignore signals that could prevent you from getting into a terrible accident. I supposed I could test if he could react to pain, but I thought better of that. I did not need this wolfman raging from injury, when my neck was so close to his teeth. Luca helped me find the next seal that corresponded: prayer. I took on the touch-sensitivity power, whose only indication of change to me was a whiteness in my field of vision that flashed then faded away like a cloak of snow. I was now three seals deep into the Codex. The other words in the third seal were: fire, the color of old moss; hail, the color of black pearl; banishment, the shade of a golden coin. Luca began at the beginning of the Codex, letting me examine the words in the midst of the protean seals until I found the right shade that matched with the color of the word fire. We found it in the word marrow near the end of the book. I summoned my courage and tapped into the amber in my hand again. My eyes followed the hares in their endless chase around the circle, their paws woven into the triskelion briar painted painstakingly in vermilion behind them. I felt a new change overtake me, a vertigo that turned the world upside-down. I couldn’t even hold my head upright, and I fell headlong into D’Afide beside me. Luca uttered a cry and tried to help me, but I had already startled D’Afide, who pushed me away. I jolted into the table, and the candle fell and rolled towards the pages of the book. I tried to stop it, reaching out to grab it before the flames could touch the dry pages, but my field of vision spun and I hit my hand against the bottom of the table instead. Only Luca was able to swat the candle away in the nick of time. “My balance.” I was also sick to my stomach. “This is a bad path, but not the one he took. Quickly, the page, so I can reverse it.” I couldn’t even right myself to see it. Another trap, one that would have prevented a user who followed the rabbit down this particular hole from seeing the right page to stop it. Clever Antlion! But Luca being here was a godsend. It proved once again that I could always use a helping hand, and not just to carry my bag of tricks for me. He brought the candle and page closer so that I could see the rabbits, and instead of following the forward path of the hares, I, seeing what they were chasing in front of them, followed the opposite direction. What the hares were being chased by, reversing change. “Antlion could have hidden the key elsewhere,” I argued. “Keep thinking, Luca, because you’re on a better path than I am. Bring the book.” I went to D’Afide in the corner and reassured him, wrapping the silk between us once more to re-establish my contact with him. “Brilliant, Luca!” Antlion indeed had the cleverness to weave such a complex shape-shifting spell into the protean seals. Luca’s sharp mind would serve him well in the future. If we succeeded in returning the Codex to Antlion, perhaps I should intensify his training. Whatever Spain was scheming, I would need men like Luca to help me thwart their plot. There was further knocking on the door and words spoken through the turn. It was muffled, but they were trying to get our attention. Luca reached into the bag of tricks that he was carrying for me and pulled out a glass mirror. We had just come from Venice, city of glass, after all. I did the same rabbit-chase transformation using the mirrored protean seal in the reflection. At first, I didn’t think there had been a change, or at least one that I noticed right away. But then I looked again at the mirror-writing words on the actual page, and my tongue flared with strange, sudden flavors. I checked the words intention, invention, and revolution in the next seal. Intention tasted of salted pork, invention of saffron, and revolution of kale. “That’s it! The path of salt.” The taste of blood. We looked for the word that corresponded to banishment, which was the shade of the polished golden coin. I found the next protean seal: wolf in the center and the three words cost, keel, and church. Cost was the color of coal and the taste of mead. Keel was the shade of ripe peach-skin and the flavor of raw herring. Church glowed with the green of a new leaf but reminded me of a salty chicken broth. The next one should be church, but had D’Afide followed that? Or was this where he had strayed? I was working blind from here, but since he had gone down one of the wrong paths, I’d have to rule out the other two branches. But maybe I was close enough with this transformation to lure him back? But if I was too far away, and he tried to undo the transformation by reading my body pattern from the silk, missing a vital step might kill him. I told Luca of my worries. I wondered. How had Antlion discovered these shapes himself? Had he pioneered every shape, even the more dangerous ones? My guess was, he used a pawn or theorized them, but I supposed he had attempted it himself. Wouldn’t he have had a safeguard in place? Especially if he risked losing his eyesight, he would want to be able to undo the change. But without sight, could he activate the Protean Seal in reverse? It had left D’Afide a freak, deaf, and blind. If I were Antlion, how would I build in a hidden escape from that? Then, I realized I had the answer all along. The second protean seal had given me extraordinary touch, so even if I couldn’t see, I might be able to feel the indentations on the page, perhaps trace the pattern. It would be a slow process, taking long to visualize what I felt under my fingertips and reconstruct the image in my mind, but at least it was an escape. “That’s no lie, my friend.” We found the word corresponding to cost: witch, tasting of field mushrooms. Not salty, which meant the seal was a dangerous one and could be the wolf-shape. With trepidation, I activated the change, feeling something click within me—just as the door to our cell opened. The Prior had the key, of course. He stood in the doorway with a gaggle of monks behind him, wide-eyed and surprised as he saw us. I wondered what he thought of two strangers, a book, and a man-wolf creature in the corner of the cell. But the change I had activated was already working its magic on me. My vision was dimming, though it hadn’t yet affected my hearing. I felt hair sprouting from all parts of my body, coarse and dense black. A pain also wracked my body as I began to grow from the Lightning infusing my flesh, and my newfound bulk ripped the clothes that I was wearing. There were cries of panic from the doorway, and Luca shouting to them to calm but with no success. I squeezed D’Afide’s hand through the silk, so he could sense that I too had taken the wolf-curse upon me. I had made a mistake; I should have risked pulling him back in the state of my last transformation. “What you see, Prior, isn’t sorcery!” Luca shouted. “Please, these are good men seeking penance here.” He was trying his best to stave off panic. If they fled and spread the rumor of this monstrosity, this terror, then we would be doomed as the local folk hunted us. Anything could happen to the Codex, to D’Afide, to Luca who was trying to shield us. He couldn’t stumble through the dark countryside with two deaf-and-blind wolfmen with us in tow. “I don’t know how much time we have. D’Afide, you might not be able to hear me, but follow my changes. Luca, the amber for D’Afide.” I reached out to touch the page that Luca held out for me. Thankfully my fingertips hadn’t sprouted hair, so I began tracing the pattern backwards. As I started feeling the Lightning change me, I forced it through the silk so that D’Afide would feel it too. I felt the extra hair shed away onto the floor, and my vision cleared. Before me, D’Afide also shed his hair, and his eyes became alert. He was becoming a normal man again. “D’Afide, can you see me?” I asked. “Thank you for keeping this book safe. But next time, don’t read something I told you not to?” I tossed him a new frock.